uPARCEL- YOU TRUST, WE DELIVER! The traditional method of sending parcels by going to a post office, fill a form, wait in queues and then request your parcel to be shipped, wastes a lot of time and sometimes unserviceable due to the weight issues or holidays, etc. But, as the technology is pacing very fast so there are courier services which offers you a numerous ways to deliver your parcel from the source to the destination place. The most common nowadays is door to door delivery, which is affordable as well as offers same day delivery if the item belongs to the same city. Here is an app for you which is an online courier service in Singapore. It’s called uParcel- your easiest way to deliver! uParcel is a door to door courier service where you can request, ship directly from your home and track your parcel. It’s very easy to use and you can deliver the items in a couple of hours and save your time. Offered by MXHL Pte Ltd., the app requires iOS 7.0 or later on your iPhone, iPod touch or iPad. The app has been updated on July 04, 2017 with so many improvements such as it has provided a feature for payment via Credit Card. The procedure of using uParcel is very simple and easy. You have to simply register to the app and then Sign In to continue. First, fill your details such as Name, Address, Phone Number, etc. and request for a delivery, take a picture of the most item(s) you want to deliver to a destination in Singapore, enter the address and request for a pick up. Secondly, the delivery agents will come to pick up the items by using smart location based identification. The best delivery agent will be assigned to pickup your parcel and then you’ve to pay the delivery charges by credit card or cash. Finally, you will be notified regarding your parcel from time to time and can track the status. If some problem arises, then you can contact with the delivery agent directly to get the updates. You can choose your pickup time as well as drop off times of the parcel. You can also send multiple parcels at a time. With uParcel, you don’t have to worry about the safety of the parcel because every parcel is automatically insured. uParcel provides 24/7 courier service anywhere in Singapore. The charges of sending a parcel starts from $4 as service charges. Overall, the uParcel can be used for a variety of purposes such as for sending a gift, returning online purchases, to surprise someone, delight customers with fast deliveries, when you forgot to bring something, outsourcing deliveries, etc. 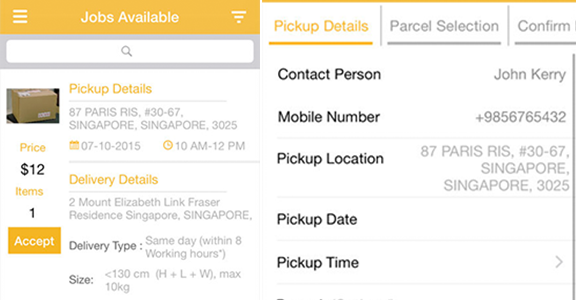 uParcel is the easiest way to deliver parcels in Singapore and more destinations will be covered very soon. The app is available for free on the iTunes Store. Get it now and start surprising your loved ones. PROS: low cost; 24/7 delivery, ship directly from home; track your parcel anytime; choose pick up and drop off times and address; send multiple parcels; each parcel is automatically ensured; fast deliveries; easy to use; reliable; on time; economical. CONS: continuous use of GPS running in the background can rapidly decrease the battery life.